Staff very friendly, hotel very clean. Breakfast was good with the selection of fruits. Where to find Lehi hotels near an airport? 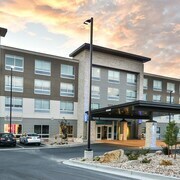 Where can I find hotels in Lehi that are near tourist attractions? 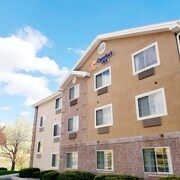 Chasing a convenient hotel while you are visiting Lehi? Lehi has approximately 12 places to stay within a short drive of the heart of town. If you are looking for a hotel that is just a stroll from the center of Lehi, Best Western Timpanogos Inn and Super 8 Lehi are ideal. 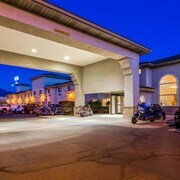 One of the small number of budget hotel choices in Lehi is the Super 8 Lehi. 30 kilometres (18 miles) from the middle of Lehi, is the Alta Peruvian Lodge. Alternatively, the Sundance Resort is situated 25 kilometres (14 miles) away. Another possibility is to make a reservation at the The Cliff Lodge and Spa or the The Inn at Solitude. Interested in seeing even more of the salt lakes, mountains and desert landscapes this area offers? Why not plan some time in other parts of Northern Utah - Salt Lake City? Whether you join in with the common regional activities, for example snowboarding, skiing and cross-country skiing, or simply tour around to see the sights you will be able to find comfortable places to stay in the area. 4 kilometres (3 miles) from Lehi is Orem, where you'll find the Timpanogos Cave National Monument. American Fork Expedia-listed hotels include the Holiday Inn Express & Suites American Fork - North Provo and Motel 6 Salt Lake City - Lehi. Alternatively, you may wish to stay at Orem, 17 kilometres (10 miles) to the southeast of Lehi. While in Orem, why not visit the Utah Valley University. 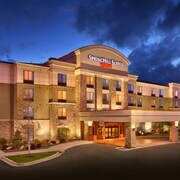 The SpringHill Suites by Marriott Provo and TownePlace Suites by Marriott Orem are all good places to stay in Orem. Just because you're traveling in Provo, doesn't mean you can't indulge in your love of sport. Maverik Center is situated 35 kilometres (22 miles) to the north of Lehi. Sports fans wishing to sleep close to the action can select from the Staybridge Suites Salt Lake-West Valley City or the Holiday Inn Express Hotel and Suites West Valley. If you are flying into Lehi, Provo Municipal Airport is a logical option. It is 20 kilometres (14 miles) away. Econo Lodge is nearby. What are the most popular Lehi hotels? Modern Apartment in Lehi With Amazing Views! Conveniently Located, Clean, Spacious, Private Entrance, and Full Kitchen! Are there hotels in other cities near Lehi? 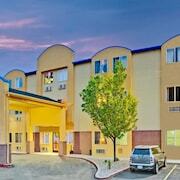 What other types of accommodations are available in Lehi? Explore Lehi with Expedia.ca’s Travel Guides to find the best flights, cars, holiday packages and more!